Welcome to Silver Streams Northwest! We offer fine handcrafted jewelry as well as designer cut cabochons and high grade rough rock for lapidary artists and jewelry designers. We hope you enjoy viewing the gemstone jewelry and semi precious gems offered for sale on these pages. Also be sure to visit our photo gallery to view jewelry, cabochons, and other semi precious gemstones on display, and to learn more about our business and the region in which our gems are mined. 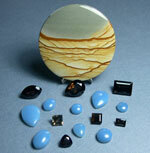 Wholesale orders are also welcome on rough rock and loose gemstones. Please contact us with your needs. Rough rock for cutting is offered for sale in these pages by the pound. Wholesale orders also welcome, by the barrel, ton, or container. Please inquire for details.